From 2006 through 2015, I supported Mike through 7 Ironmans. I saw all the hard work and dedication it took to get to the start and finish lines. I say it often, and I truly believe it, that Mike is one of the strongest people I know. The amount of suffering he was willing to endure for Ironman always filled me with awe. It was something that I didn't think I could do. Heck, it was something I wasn't really sure I WANTED to do! Last weekend saw my longest training ride and run. On Saturday I did a 113.9 mile bike-4.3 mile run race rehearsal. On Sunday I ran 17 miles. Sunday was also Maddie's 6th birthday, so after my run was done, I immediately turned triathlete mode off and mom mode on. After some stretching and a shower, Maddie and I headed to the store to get the cake, food and drinks for her party. I also had some minor crafting to finish up for the decorations. The party was fun, but it’s always stressful to be a host! Mike and I were exhausted afterwards and were just sort of running on muscle memory to get us through the evening. So, I didn’t really have a chance to sit back and reflect on my training. During my hour-long commute to work this morning, it really sank in that I just made it through the hardest part of training. I got choked up thinking about my accomplishment. Getting here was not an easy road. I’m sure it never is for anybody. At times, I was totally overwhelmed with work, home life and training. The whole car drama sometimes threatened to be the straw that broke the camel’s back. Full disclosure, there were days in the past few weeks that I was literally thinking “I don’t want to be here” as I was riding my bike. My mind was heavy and my body felt weary. But, somehow I found a way to get through it. Being someone that struggles with, sometimes, crippling self-doubt, I am so proud of myself today. I know this journey isn’t over yet. I still have the actual race to do. 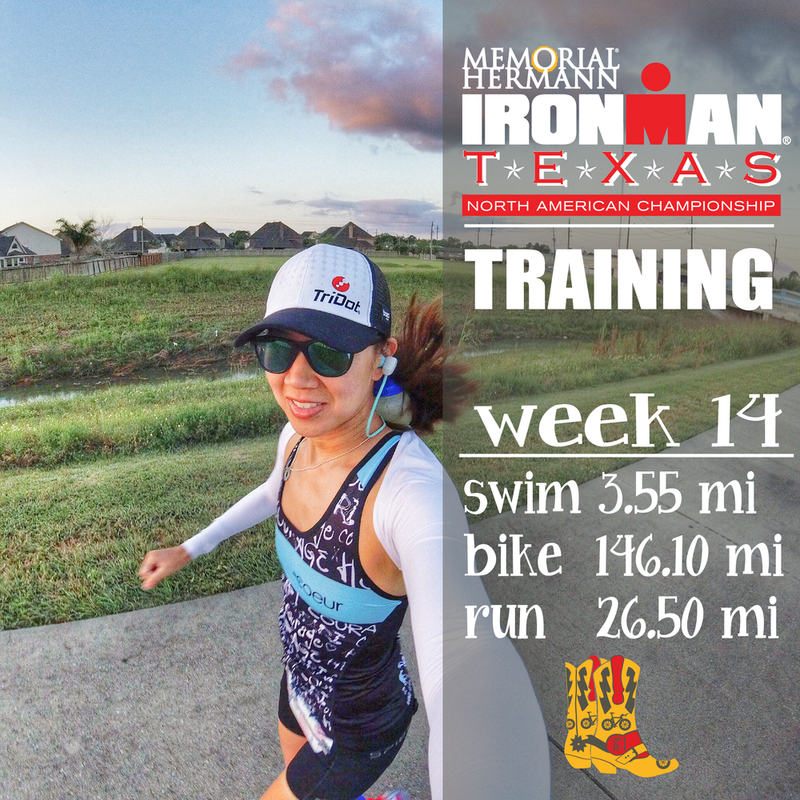 But, from where I stand, 12 days out from Ironman Texas, I feel confident and ready. In the grand scheme of life, 3-1/2 months isn't a very long time. But, it's amazing how much your life can change in such a short period. Over the past 14 weeks, I've learned that, in fact, I CAN and DO WANT to do all this training. I've learned that I am stronger than I ever knew I was. Or ever could be. I've learned that it's ok to be scared, but to not let fear stop you from trying, because you'll surprise yourself how you rise to the challenge. And the most important thing I've learned is to believe in myself.